Reflects the source clip into an octagonal pattern of right triangles. The 'Inside' parameters transform the Source image before it is reflected into the pattern. The Center and Z Dist transform the entire result including the reflection pattern, and the Rotate affects only the reflecting 'mirrors'. Center location of the kaleidoscoped image in screen coordinates relative to the center of the frame. The entire result will be shifted by this amount. Inside Shift: X & Y, Default: [0 0], Range: any. Translates the source image inside the kaleidoscope before it is reflected. Inside Z Dist: Default: 1, Range: 0.001 or greater. 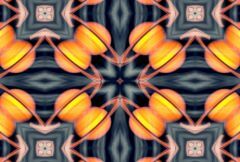 Zooms the source image in or out inside the kaleidoscope before it is reflected. Rotates the source image inside the kaleidoscope before it is reflected. Determines the method for accessing outside the borders of the source image. This is used only if the image inside the kaleidoscope is not contained within the shape of mirrors. If enabled, the Source image is resampled using pixel averaging. This removes aliasing and gives a higher quality result, although it may not be necessary if your input image is smooth with no sharp edges or high frequencies.